Microsoft Office has since a very long time a bug when it comes to copied data from Excel that you try to past as a picture in to a other Office application. The table often gets totally messed up might miss rows and columns even. This happens when you copy the data from Excel and try to insert it in to e.g. Microsoft Word with the special insert option Insert as Picture. 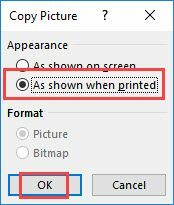 The issue is well known and the solution is actually pretty simple – you don’t copy the data from Excel, you copy a picture with a specific setting. This also allows you to insert the copied data respective image in to any other application as an picture without using screenshot tools like the Windows internal Snipping tool. Please note – you can also change your quick access menu in Excel and add the Copy As Image there for easier access to it.